There is a profound irony in occupational data showing that, among the approximately 800 job categories surveyed by the OSDS, cashiers are in greatest demand, while paperhangers suffer the smallest demand. If the source of that irony is not obvious, let me spell it out: “p-a-p-e-r”. With the odds stacked like a mile-high stack of dollar bills in favor of cashiers, but against paperhangers, we might be forgiven for expecting that the two occupations must be dramatically different. The irony is that on closer analysis they aren’t so disparate, despite there being on average and annually odds of 17,199 to 1 that a job posting will be for a cashier rather than for a paperhanger. What makes them, despite the statistical gulf between them, two sides of the same coin—or, more aptly, the two sides of the same dollar bill or sheet of wall paper? Answer: “Paper management”. Carefully compare precisely what it is that a cashier does with what a paperhanger does, and ponder whether they are, after all, so different—different enough to explain not only the huge disparity in job numbers, but also the implied enormous gap in demand for their services. Ah—you think that the numbers ARE the demand. Not exactly. It depends on your concept of demand. In any war-torn society, the “pent-up demand” for grocers, doctors, teachers, truck drivers, etc., could be huge, even though, in virtue of the chaos of war, there are no actual job openings. Ditto for the paperhangers: There could be enormous pent-up demand for them among householders who simply cannot afford the paperhangers because they can no longer afford their houses and their walls. They really want wallpaper, just as they really want to keep their houses. Can anyone imagine that millions of sub-prime loan induced home foreclosures and sagging home prices really translate into a falling psychological demand for housing? Moreover, posted demand, in the form of employer ads or listings with a recruiter or government agency isn’t necessarily the same as real demand, since many jobs are offered and taken with no recorded intermediary. For example, not only have I obtained unadvertised, unsolicited employment, I have also, in some instances, created the demand for my services–at least in the psychological sense of “demand”. It should not be assumed that there is only limited work for herders in Kenya’s Masai Mara just because there are no job boards or newspaper ads seeking cattle herders. Theoretically, for any position, there can be strong demand matched by comparable supply, creating an economic equilibrium requiring no further recruitment. So, the 10 annual “openings” for paperhangers does not establish that there is massive unemployment or underemployment among them; nor does it prove that there are few paperhangers. Likewise, and most importantly for this discussion, it does not prove there is no demand for them. What the small number of openings does prove is that if you are an unemployed paperhanger, you are going to have to do a lot of networking to find work in your trade—unless you normally find work the way a Masai herder does: directly, without the help of ads, recruiters, job boards or government job agents. On the flip side, it is possible that despite the huge number of job openings for cashiers, the psychological demand—as opposed to market demand—is much lower. At one time, the writings of Joseph Stalin, measured by volumes published and distributed, ranked number 1 in the world. Gauged by those numbers, the “demand” for his screeds must have been surpassed only by the fear of being asked by a big guy in a black trench coat and black unmarked Volga creeping up alongside, “So, comrade, where is your copy of Comrade Stalin’s writings?” Analogously, being forced to have cashiers doesn’t mean wanting them. Ask anybody in a slow line at the supermarket. With this psychological leveling of the cashier-paperhanger playing and paying field completed, the commonalities between the two occupations may seem less surprising. What are they? Obviously, trivially and usually, although nowadays less frequently, both are given paper in exchange for paper (unless you have exact change at the supermarket or are not getting back more than $1). Also, when a cashier has to field a bad check, she’s had an encounter with a “paper hanger”, in the second sense of the term. However, the deeper similarities are also far more interesting. Both cashier and paperhanger are required as a “medium of exchange” that manages or operates through another medium of exchange—the cashier, as a medium, exchanging goods for money, a second medium, while the paperhanger exchanges not only his services and paper for your cash, but also the perfectly good wallpaper on your living room wall for the one that your spouse inexplicably thinks you need. 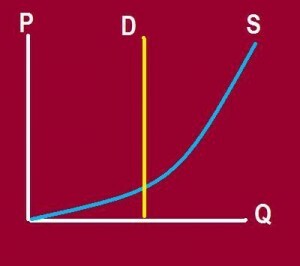 This may—if I’ve succeeded—sound like a joke, but the serious point is that cashiers are virtually numberless because the medium of exchange—be it paper currency, coins, debit cards, credit cards, food stamps or other vouchers—itself has huge and virtually inelastic demand, or at least demand that is never less than the demand for everything else (reflected in changes in M1, the cash money supply)— with the exception of ancient or modern underground tax-fleeing barter. The cashier is a “medium”(much as a fortune teller or a bank teller is a medium) of exchange for the primary medium of exchange, money. The paperhanger is a medium of exchange for the third most important household paper, wallpaper (the first being toilet paper, the second, money). Of course this demand for the money medium of exchange is only a necessary condition for the abundance of cashier jobs, not a sufficient one. Once technology makes human mediation of purchases unnecessary, the cashiers, like the paperhangers, will have their backs to the wall and be left out to dry and hang—not paper-hang—on. The analytical lesson in all of this is this: When the job openings in one field completely dwarf in numbers those of another, don’t end your analysis of the phenomenon with the mantras of “high demand” or “demand exceeds supply”. Start there, and then refine it with questions about whether or not that demand reflects pent-up demand, inelastic demand or some other quirk of the economy. The “demand” for Stalin’s writings and the money-managing cashier reflect not so much “psychological demand” or real desire or real fear as much as inelastic demand resulting from an imposed, mandatory regime—in these instances a Soviet paper-pushing ideological publishing regime and a cash-based paper-pushing cashier-managed economy. Accordingly, one key to job-hunting success may be to target job categories that feature such high and inelastic demand—comparable to the demand for salt, which varies little with price. Ideally, from the standpoint of personal income, even if not from the standpoint of freedom from coercion, jobs in sectors characterized by imposed regulatory, ideological or technological regimes may be those with the greatest number of job openings—depending on their scale and economies of scale. This is a key lesson to be learned not only from the market for cashiers and paperhangers, but also from the history of salt and salt mines. As for the bereft paperhanger, one can only speculate how world history might have been vastly different if one underemployed Vienna paperhanger** and army corporal had been able to benefit more from pent-up demand for wallpaper than from pent-up demand for revenge after the collapse of Germany’s Weimar Republic— “paper anger”, so to speak, catalyzed by the hyperinflation that rendered the German “Papiermark” (“Paper Mark”) all but worthless. But the modern paperhanger may have a brighter future than in that gloomy past: As houses, apartments and rooms are subdivided to accommodate more roaming home-hunting people and to generate more rental revenue in tough times, paperhangers may just find themselves facing more walls.